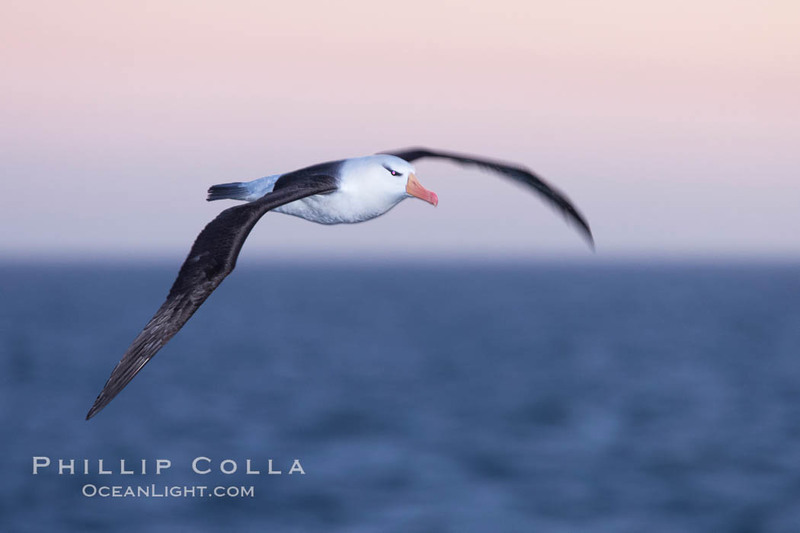 One of the unexpected joys of the trip for me was the albatrosses. Before this trip, the only albatrosses I had seen were Waved Albatross in Galapagos (but only sitting on nests) and some distant albatrosses as we motored at sea to Guadalupe Island. Now that I have had a chance to really see them, soaring as they do over the open ocean, I love these birds. On this night we had just left the enormous rookery of black-browed albatross at Steeple Jason Island in the Falklands, on our way to South Georgia Island. While eating dinner I noticed out the dining room window how the sky was growing pink, and I could see albatrosses occasionally flying by the window. I rudely chugged my wine and gobbled the rest of my dinner, made some weak excuse to my dining companions that I would be right back, and quickly made my way to the stern with my camera setup. I stood out there in the fading light and fresh air making a set of what I think of as “painterly images” of albatrosses and petrels. I used a Canon 1Ds Mark III camera with a 300 f/2.8 lens and 1.4x converter. The light was growing faint making it easy to match the available light of the waning dusk with the artificial light from the camera’s flash. It was about an hour after sunset, a time when the pastel colors in the sky become quite saturated. 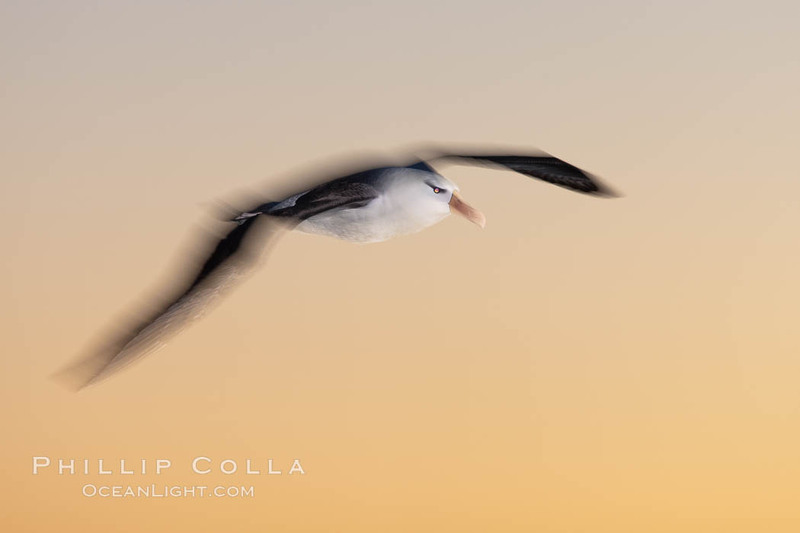 I popped a little flash on this beautiful seabird and dragged the shutter to give the shot some blur. I shot several hundred of these images and managed many keepers, each using the fading colors in the sky as a canvas ranging from pink to purple to yellow depending on which direction I pointed my camera.